In the United States today is tax day. To wear off some of that sting from the tax man Smuggler's Cove, one of the most popular Tiki bars in the U.S., is celebrating National Painkiller Day. Sadly, Smuggler's Cove is across the country from me, but that isn't stopping me from having a good old Painkiller. This Tiki cocktail was invented in the 1970s at the at The Soggy Dollar Bar in the British Virgin Islands. The Soggy Dollar has no dock so it's visitors have to swim to shore from their boats getting their money all wet, and that is how the bar got it's name. The original Painkiller recipe is top secret, and is still being served to this day at The Soggy Dollar. However, through some reverse engineering by some people with much better taste buds than mine you no longer have to go to The Soggy Dollar to enjoy this Tiki cocktail. Shake the ingredients together until the shaker is frosty on the outside. Then, pour it into a large glass or Tiki mug. You may want to use a Tiki mug for this one because this great tasting drink isn't very pretty to look at. Then, sprinkle some Nutmeg and Cinnamon on top. Garnish with an orange wheel, pineapple slice, and cinnamon stick. The Painkiller really surprised me with how amazing it was. The Lopez Coconut cream gives a delicious coconut flavor to the drink, and the pineapple juice blends in nicely. I've tried other brands of Cream of Coconut, but Lopez is the best. The only place I can find Lopez, near me, is at Wal-Mart. I went to the Soggy Dollar's website to do research for this post, and they have the relaxing sound of waves crashing to the shore playing on their site. I usually hate it when websites have background sounds, but the waves are very peaceful. So pull up their website while sipping on your Painkiller and your cares will drift away even faster. A while back one of my friends on Facebook, Elliot, asked how to make a good Scorpion, because the ones he makes don't turn out all that great. We've all been there. I've poured some absolutely horrible cocktails. So, I thought I would finally do some taste testing and provide some tips. 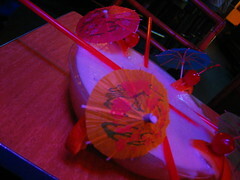 The Scorpion was invented by Trader Vic and is normally served in in a scorpion bowl (above). A scorpion bowl usually serves more than one person. First, I tried the classic Trader Vic's Scorpion recipe. It has silver rum, brandy, orange juice, lemon juice, and orgeat syrup. For my taste test I decided to try the single serving recipe that I found in the book Trader Vic's Tiki Party! : Cocktails and Food to Share with Friends . This was a mighty strong concoction. The rum and brandy comes through really strong. There is a lot more brandy and alcohol in general in this version compared to the full scorpion bowl. The orange and lemon gave a nice citrus flavor and the orgeat syrup helped cut down on the boozy taste. I realize it is a Scorpion and needs to have a sting, but the whole thing seemed a bit off balance. I can't say I have a new favorite here. The Luau ScorpionNext, up was the Luau Scorpion. This recipe hails form the Luau of Beverly Hills, and dates back to 1958. I found the recipe in Beach Bum Berry Remixed . This version has gold rum, gin, brandy, orange juice, lime juice, orgeat syrup, and sugar syrup. This scorpion is far superior to to the first. The gin adds an interesting level of complexity to the drink. It isn't overpowering, but blends well with the rum and citrus. The lime juice seems to work better versus the lemon juice in the first recipe. There is a little more syrup in this version, but it isn't too syrupy or sweet. It really is the perfect balance, and it still give a fun little sting. The Luau Scorpion is going to be the standard scorpion served in my Tiki bar from now on. As always for Tiki cocktails, use fresh juice. Buy the fruit and juice them yourself. It's amazing what a difference that makes! Again, this can make a big difference. I used Korbel Brandy, and Rehorst Gin. Rehorst is a Milwaukee Gin, but any quality Gin will do. Different brands of Brandy can be very different. So be sure to stick with a good one. You can't go wrong with Korbel. With a lot of classic Tiki cocktails sloppy measuring can change the drink significantly. So if it isn't tasting good make sure you are measuring correctly. It's not difficult to make great Tiki cocktails. Give the Luau Scorpion a try. Now, you are probably looking for the recipe. I don't think it's right for me to give all the recipes out of these books. People worked hard to put them together. So if you want the recipes buy the book and support Tiki culture. I have links to them on Amazon over on the left side of the page. If you really don't want to buy the book I'm sure Google will help you find the recipe. I hope this helps Eliot! If you have a Tiki cocktail question let me know. I'll do my best to answer it.